You can use the Directory tab and the Property Editor on the Directory Server Console to add, modify, or delete entries individually. To add several entries simultaneously, use the command-line utilities described in Section 3.1, “Managing Entries Using the Command Line”. You cannot modify your directory unless the appropriate access control rules have been set. For information on creating access control rules for your directory, see Chapter 18, Managing Access Control. Each time a new database is created, it is associated with the suffix that will be stored in the database. The directory entry representing that suffix is not automatically created. 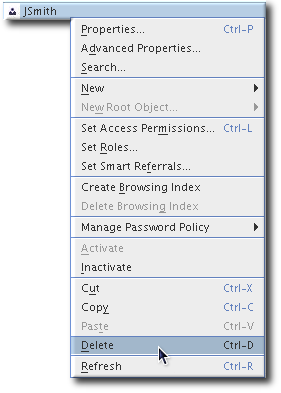 Right-click on the Data entry in the left menu, and select New Root Suffix from the menu. 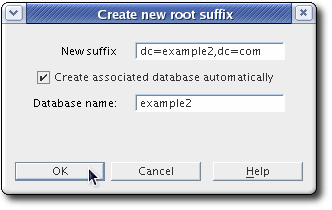 Fill in the new suffix and database information. 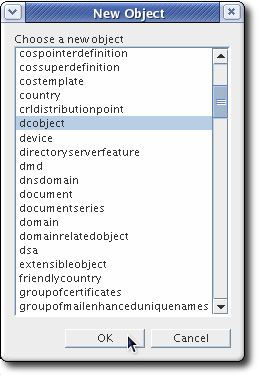 In the Directory tab, right-click the top object representing the Directory Server, and choose New Root Object. The secondary menu under New Root Object displays the new suffixes without a corresponding directory entry. Choose the suffix corresponding to the entry to create. 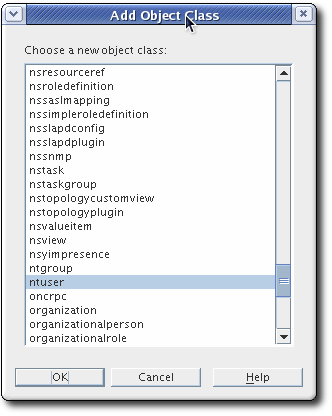 In the New Object window, select the object class corresponding to the new entry. The object class must contain the attribute used to name the suffix. For example, if the entry corresponds to the suffix ou=people,dc=example,dc=com, then choose the organizationalUnit object class or another object class that allows the ou attribute. Click OK in the New Object window. The Property Editor for the new entry opens. You can either accept the current values by clicking OK or modify the entry, as explained in Section 3.2.3, “Modifying Directory Entries”. Directory Server Console offers predefined templates, with preset forms, for new directory entries. Table 3.1, “Entry Templates and Corresponding Object Classes” shows what type of object class is used for each template. Another type, Other allows any kind of entry to be created by allowing users to select the specific object classes and attributes to apply. In the left pane, right-click the main entry to add the new entry, and select the type of entry: User, Group, Organizational Unit, Role, Class of Service, or Other. If the new entry type was Other, then a list of object classes opens. Select an object class from the list to define the new entry. Supply a value for all the listed attributes. Required attributes are marked with an asterisk (*). To display the full list of attributes available for the object class (entry type), click the Advanced button. 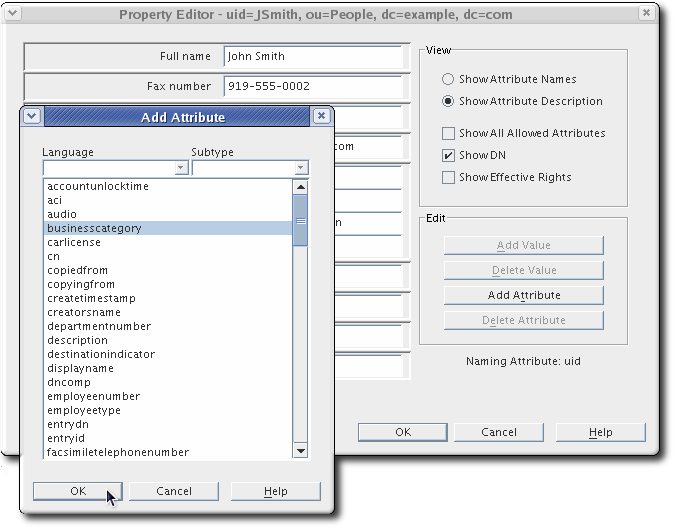 In the Property Editor, select any additional attributes, and fill in the attribute values. Click OK to save the entry. The new entry is listed in the right pane. Modifying directory entries in Directory Server Console uses a dialog window called the Property Editor. 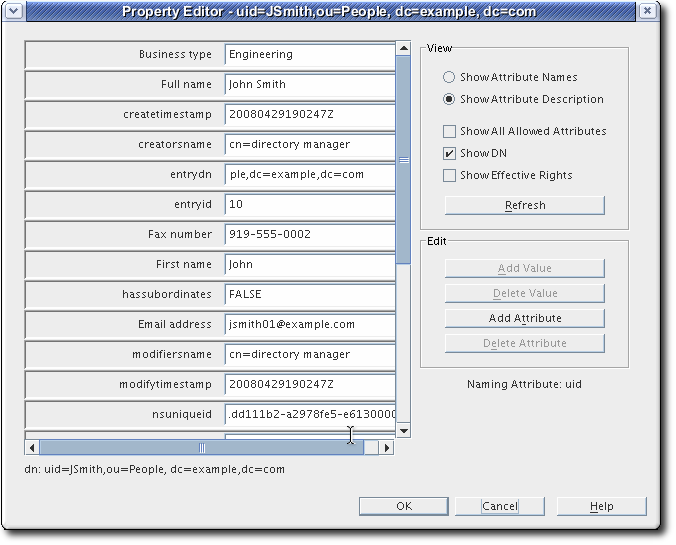 The Property Editor contains the list of object classes and attributes belonging to an entry and can be used to edit the object classes and attributes belonging to that entry by adding and removing object classes, attributes and attribute values, and attribute subtypes. From the Directory tab, by right-clicking an entry, and selecting Advanced Properties from the pop-up menu. In the Directory tab of the Directory Server Console, right-click the entry to modify, and select Advanced from the pop-up menu. Select the object class field, and click Add Value. The Add Object Class window opens. It shows a list of object classes that can be added to the entry. Select the object class to add, and click OK.
To remove an object class from an entry, click the text box for the object class to remove, and then click Delete Value. Before you can add an attribute to an entry, the entry must contain an object class that either requires or allows the attribute. See Section 3.2.3.1, “Adding or Removing an Object Class to an Entry” and Chapter 12, Managing the Directory Schema for more information. Select the attribute to add from the list, and click OK. If the attribute you want to add is not listed, add the object class containing the attribute first, then add the attribute. See Section 3.2.3.1, “Adding or Removing an Object Class to an Entry” for instructions on adding an object class. If you do not know which object class contains the attribute you need, look up the attribute in the Red Hat Directory Server 10 Configuration, Command, and File Reference., which lists the object classes which use that attribute. 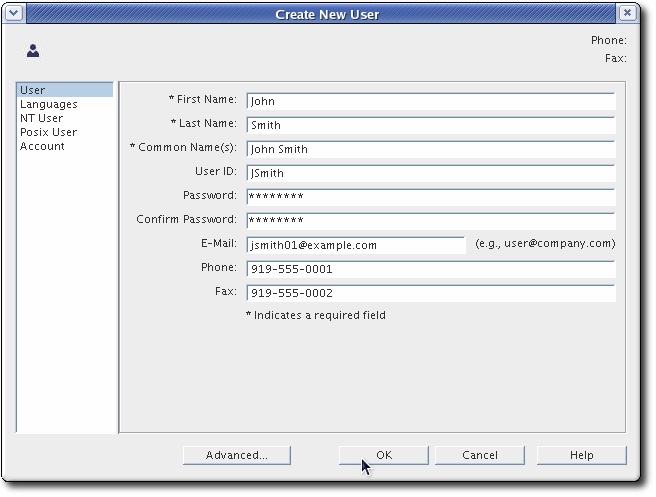 Type in the value for the new attribute in the field to the right of the attribute name. To remove the attribute and all its values from the entry, select Delete Attribute from the Edit menu. The configuration attribute nsslapd-maxbersize sets the maximum size limit for LDAP requests. The default configuration of Directory Server sets this attribute at 2 megabytes. LDAP add or modify operations will fail when attempting to add very large attributes that result in a request that is larger than 2 megabytes. However, the limit is not applied to replication processes. To add very large attributes, first change the setting for the nsslapd-maxbersize configuration attribute to a value larger than the largest LDAP request you will make. One common issue that requires increasing the nsslapd-maxbersize setting is using attributes which hold CRL values, such as certificateRevocationList, authorityRevocationList, and deltaRevocationList. 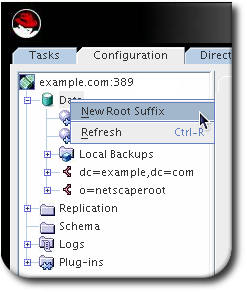 For further information about the nsslapd-maxbersize attribute, see the corresponding section in the Red Hat Directory Server Configuration, Command, and File Reference. Multi-valued attributes allow multiple value for one attribute to be added to an entry. Select the attribute to which to add a value, and then click Add Value. Type in the new attribute value. 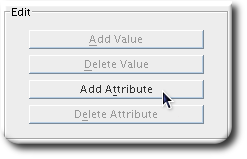 To remove an attribute value from an entry, click the text box of the attribute value to remove, and click Delete Value. A subtype allows the same entry value to be represented in different ways, such as providing a foreign-characterset version. There three different kinds of subtypes to attributes which can be added to an entry: language, binary, and pronunciation. 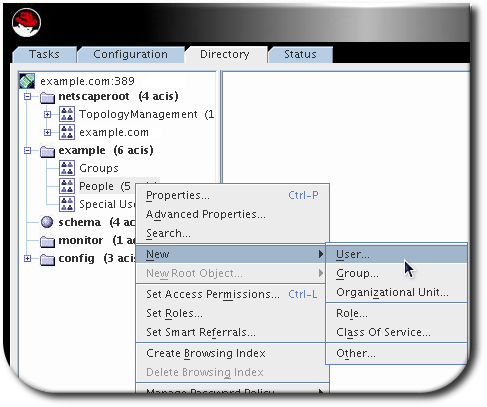 In the Directory tab of the Directory Server Console, right-click the entry to modify, and select Properties from the pop-up menu. Click Add Attribute, and select the attribute to add from the list. 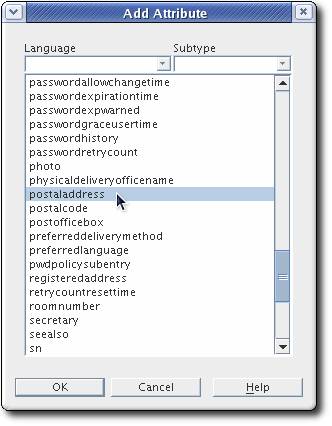 Add a language subtype by selecting a value from the Language drop-down list. 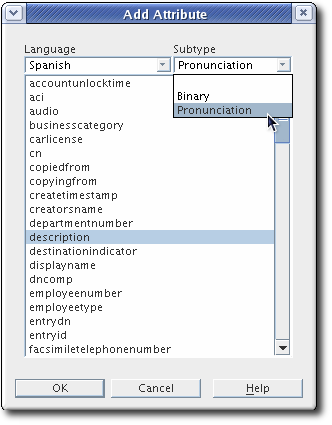 Add either a binary or pronunciation subtype by selecting a value from the Subtype drop-down list. 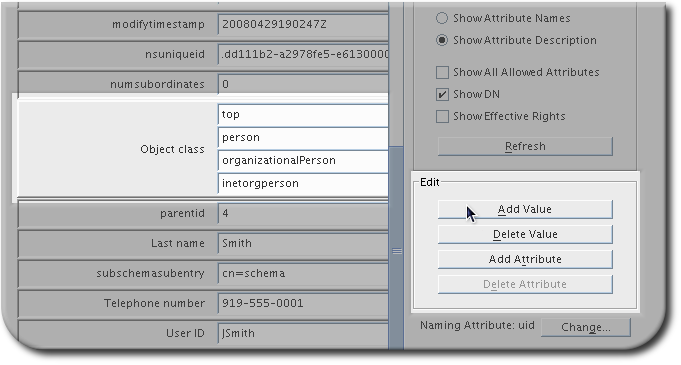 attribute is the attribute being added to the entry and subtype is the two character abbreviation for the language. The supported language subtypes are listed in Table D.1, “Supported Language Subtypes”. Assigning the binary subtype to an attribute indicates that the attribute value is binary, such as user certificates (usercertificate;binary). Although you can store binary data within an attribute that does not contain the binary subtype (for example, jpegphoto), the binary subtype indicates to clients that multiple variants of the attribute type may exist. Assigning the pronunciation subtype to an attribute indicates that the attribute value is a phonetic representation. The subtype is added to the attribute name as attribute;phonetic. This subtype is commonly used in combination with a language subtype for languages that have more than one alphabet, where one is a phonetic representation. This subtype is useful with attributes that are expected to contain user names, such as cn or givenname. For example, givenname;lang-ja;phonetic indicates that the attribute value is the phonetic version of the user's Japanese name. Right-click the entry to delete, and select Delete from the right-click menu. The server deletes the entry or entries immediately. There is no way to undo the delete operation.